The market for metal products in the U.S. grew 4% annually over the past five years, according to an industry study released by the Metal Construction Association (MCA). This growth is significant because it occurred from 2009 through 2014, during the economic downturn when construction volumes declined and building owners and specifiers were particularly cost conscious. The market for metal roofing was even greater. Growth was seen in both the residential and commercial sectors. In the residential market, use of metal roofing grew 7.1% in new construction and 4.1% in replacement roofing. 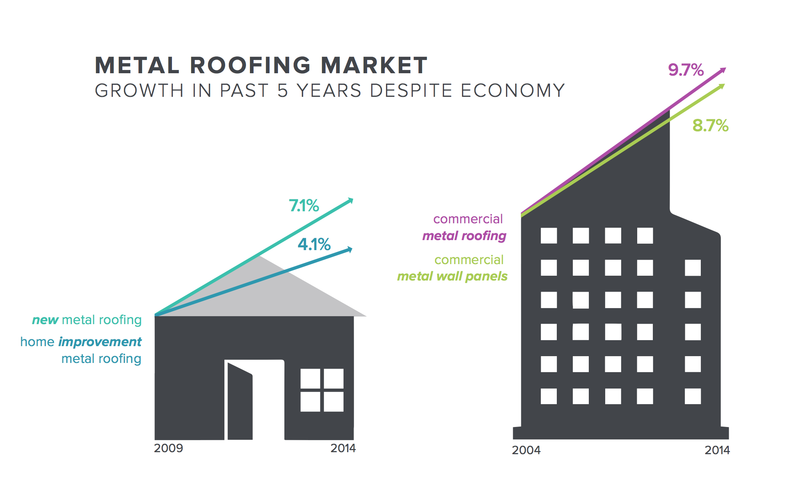 In the commercial sector, metal roofing grew 9.7% in the five-year period. The industry also saw an 8.7% growth in metal wall panels in commercial building during this same time period. The market for Metal roofing grew 9.7% in the Commercial sector and 7.1% in Residential New Construction, in the past 5 years. MCA credits much of this growth to the metal industry’s efforts to educate the design community about the long-term value of metal roof and wall products. Key benefits of metal products over competitive materials include: energy efficiency and performance, LEED certification/green building, aesthetic appeal, life cycle cost, durability, and speed of construction. MCA joined together with five partner associations beginning in 2009 to compile the data for this Industry Study. The purpose was to create a custom market model using standard measures in order to track industry growth over time. Study participants included data from the key associations: The American Iron & Steel Institute (AISI), the Aluminum Association (AA), Metal Roofing Alliance, National Frame Builders Association (NFBA) and the National Coil Coaters Association (NCCA).